The problem was trying to find an open restaurant on Monday night in the Student ghetto area around McGill. We were going to the ‘Discovery Series’ at the MAI on Jeanne-Mance, and time was tight. We walked towards St. Laurent – nothing. We tried the Cite de Parc shopping center – fast food only. Then we started walking up and down Parc. We were getting desperate, and going hungry wasn’t a good option. Theatre on an empty stomach is the pits! I spotted the electric ‘Open’ sign from across the street – and we jay-walked (sorry folks) across to see if it looked good. Interestingly, the propped open front door looked inviting – and we were really down to ‘now or never’. So we walked in. The Restaurant Asha looks to have been in this location forever – long and thin, with – I’m not kidding – crystal chandlers evenly spaced throughout the space – its theme is red, red, red with a splash of white. Ok – clearly says ‘Indian’ to me. We were so pressed for time – we did the unthinkable – and ordered a set meal for 2 for $40. It included Onion Bhaji, Mulligatawny soup, Butter Chicken, Spicy Chick peas, Beef and Spinach, Rice, and even desert. How wrong can you go? The waiter rushed our order to the back, and then brought us our drinks (on draft Taj Mahal beer) and outstanding Papdum. I was truly impressed and inquired – yup – they were home-made. Maybe this is a stellar find? That would be cool. Unfortunately, the rest of the meal was ok – but not great. Oh well. The Onion Bhaji were lacking in onion although the dipping sauce was pleasant, the spicy chick-peas weren’t very spicy, and the butter chicken was a disturbingly bright orange. But I guess you get what you deserve if you order set courses – clearly prepared long ahead and thankfully served quickly – they are never going to be at the level of things that require a bit more last-minute prep. Oh well. At least they might have asked if we wanted the food mild or spicy. I would have definitely asked for spicy. Aside from the Papadum and the beer – there was one other highlight – I don’t generally care for Nan – tends to be greasy – but the Nan here was wonderful. Clearly the bread maker knows his stuff. 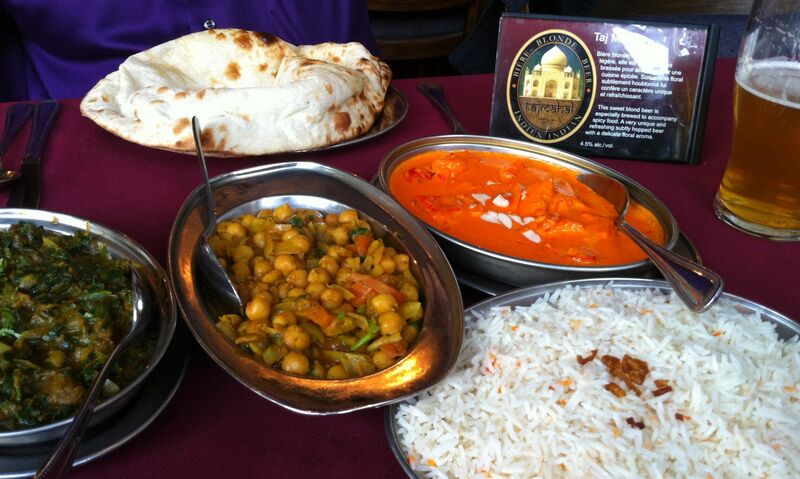 We made the theatre on time – and I might give the Restaurant Asha another chance. It was very reasonable for the quantity of food provided, and the location is quite convenient to the Mai Theatre and the Cinema du Parc – both places I frequent regularly. And they have table cloths. I like inexpensive restaurants with tablecloths. And the beer was excellent. ← What’s better than Great Chocolate? Absolutely Nothing! Asha has been around since 1982. Prior to that there was a restaurant called Tommy’s there.